Decades of tagging white sharks in the eastern Pacific have taught us that large white sharks are more of an oceanic pelagic fish than a coastal one. They leave the west coast of North America to open ocean habitats for much – if not most – of the year, and females may remain offshore for more than 12 months, staying in the warm waters of the Central Pacific. These offshore habitats are generally considered to be “oceanic deserts,” especially when considered next to the highly productive waters of the California Current. This current supports a diversity of potential prey, including white sharks’ favorite prey: marine mammals and pinnipeds. This reduced availability of potential prey in offshore habitats leads to one of the fundamental questions surrounding white sharks in the Café – what are they eating? How can the largest predatory fish in the world make a living in an “oceanic desert”? The stable isotope composition (the ratio of heavy to light isotopes of carbon and nitrogen) of an animal’s tissues can be used as an intrinsic marker to understand its diet. After a predator consumes and digests its prey, it assimilates the protein from the prey into its own tissues, transferring the stable isotope signature of that prey to the predator. Furthermore, if an animal migrates between regions where the stable isotope composition of their prey changes, the stable isotope composition of the migratory animal will shift over time to reflect its diet in its new habitat. 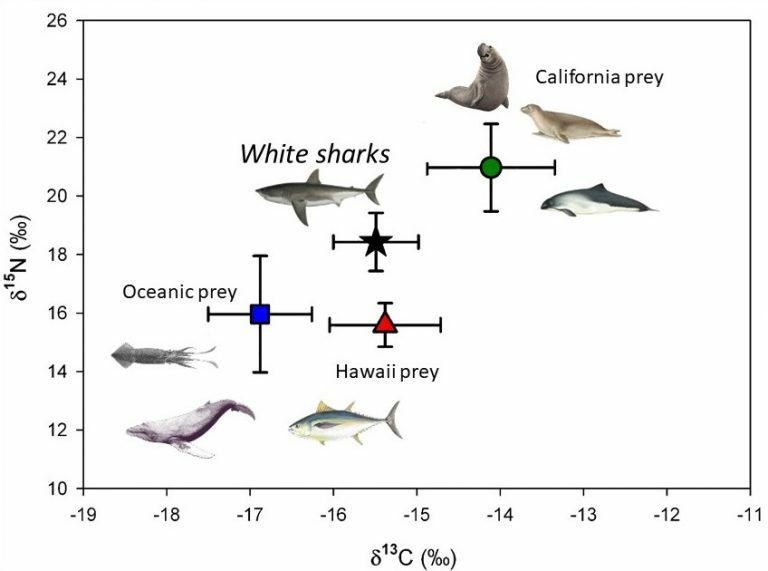 These stable isotope dynamics, combined with the the migratory pattern of white sharks, means that we can collect tissue samples from sharks in California and understand what they might be eating offshore. Prior research from Barbara Block’s lab, led by myself, used this approach and demonstrated that white sharks feed enough while offshore to incorporate a clear isotopic signature of prey from the White Shark Café and other oceanic habitats. However, our results also suggested that they fed at a much lower rate than when in coastal habitats. While this provided valuable initial insight into what white sharks were doing offshore, additional research is required to fully answer these questions, and there remains much that is unknown about how white sharks use oceanic ecosystems such as the White Shark Café. One of the goals of this research cruise is to characterize the stable isotope composition of the different parts of the pelagic and mesopelagic food webs that support white sharks in the Café in order to better understand their structure and function, as well as to provide insight into how these food webs can support a large apex predator such as the white shark. 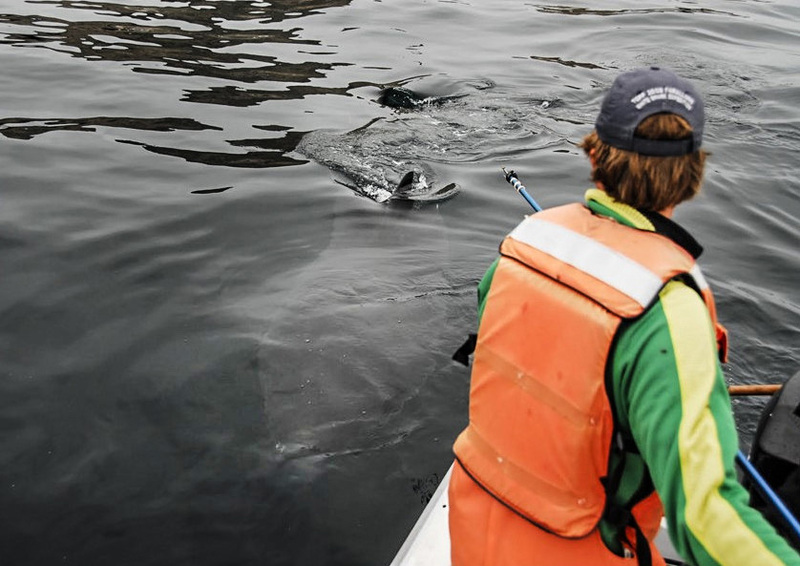 We will accomplish this by collecting tissue samples from animals that we collect during our trawling, fishing, and tagging efforts, and then analyzing those samples once we are back home. This stable isotope dataset – in combination with the tissue samples that have continued to be collected from white sharks in California – will allow us to better understand how white sharks fit into these oceanic ecosystems. Sometimes being able to answer a seemingly simple question such as “What does a white shark eat in the Café?” or “How much does a white shark eat in the Café?” can provide unique and important insight into why the sharks may be out here in the first place. Luckily, because white sharks “are what they eat,” we may finally be able to answer these basic but fundamentally important questions. 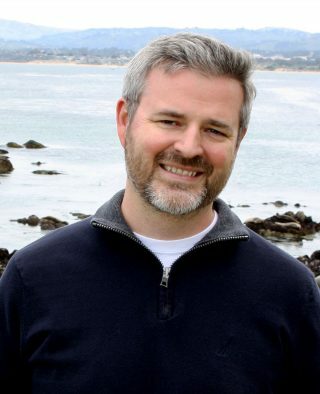 Dr. Aaron Carlisle is marine biologist interested in the spatial, trophic, and physiological ecology of marine fishes. 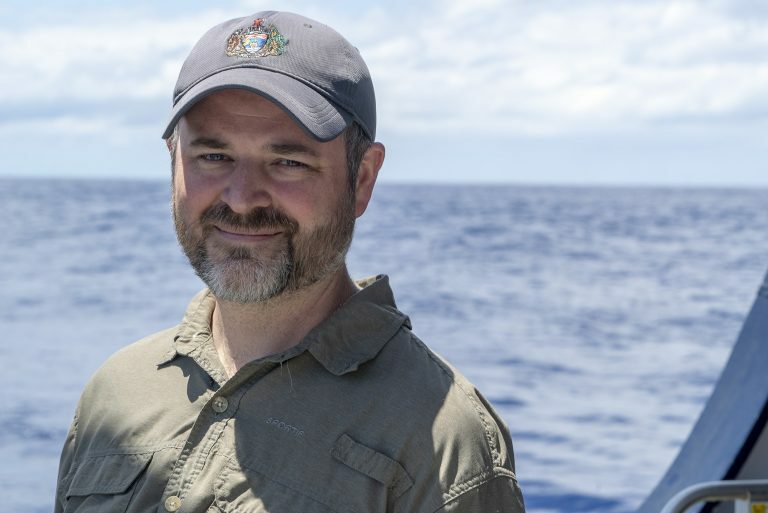 His work has largely focused on pelagic fishes and elasmobranchs (sharks, skates, and rays), and he employs a variety of research techniques, including chemical tracers (e.g. stable isotope analysis), electronic tagging, and modeling approaches.